Hawaiian slack key guitar master George Kahumoku, Jr.
Now in its 6th consecutive year, every Wednesday evening George Kahumoku’s Masters of Slack Key Guitar in Napili gives visitors a dose of the real Hawaiian aloha — a must see. Slack-key guitar is a genre of guitar playing that is native to Hawaii. Slack refers to the loosening of the tuning pegs such that different open tunings allow a more natural sound. “He’s not here. He’s on tour on the mainland. A solo guitar tour,” I said. George Kahumoku, or Uncle George as he is affectionately called, is Hawaii’s Renaissance man. 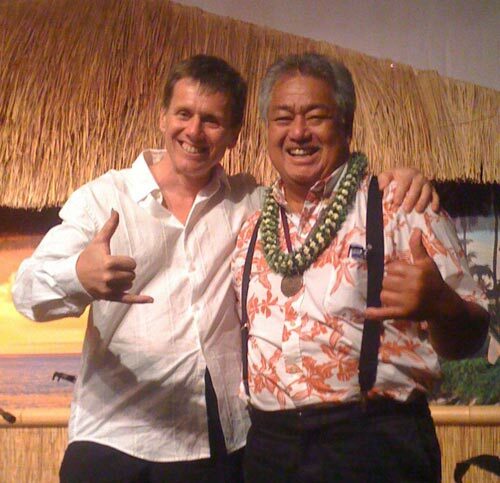 Winner of several Grammy and Hoku Awards, he is a master slack key guitarist, songwriter, world-traveling performer, high school and college teacher, artist and sculptor, storyteller and writer, farmer and entrepreneur. Needless to say, George has been there, done that. He knows many people. The second time I met George was in a computer training session. Sensing my curiosity about his “Masters of Slack Key Guitar ” concert that Thursday evening of 10th March 2011, he gave me two tickets for the McCoy Theatre at the Maui Arts and Cultural Centre. The third time we met in the Maui College canteen. I mentioned that I was looking for a piano to practise on. He told me he was teaching that evening and could give me access to a grand piano. The fourth time we met was that evening, to deliver an autographed copy of a new book that was signed at an event that Robert Bekkers played at. We interrupted his Hawaiian guitar class. “Come to my show at Napili tomorrow,” invited George Kahumoku, Jr. as we exchanged contact details after the class and near his truck. Napili is a place north of Lahaina and Kanaapali on the other side of the Wailuku mountains. The short way to get there is the treacherous and dangerous way on shoulderless roads. The longer way is the safer way south, east, and north. There is no path across or through the Wailuku mountains to reach the west side that is famous for romantic sunsets. We had the lame excuse that we were performing at the Four Seasons in Wailea last Wednesday and could not drive the 40 minutes to see his weekly show at Napili. When the Four Seasons manager called this past Tuesday afternoon to cancel what would have been our second Wednesday performance, the initial disappointment turned into a blessing in disguise. “Bring your guitar,” George had phoned Robert that Wednesday morning. We drove the hour journey to Napili Kai Beach Resort where the show was to begin at 7:30 pm. “He’s my student,” said George. 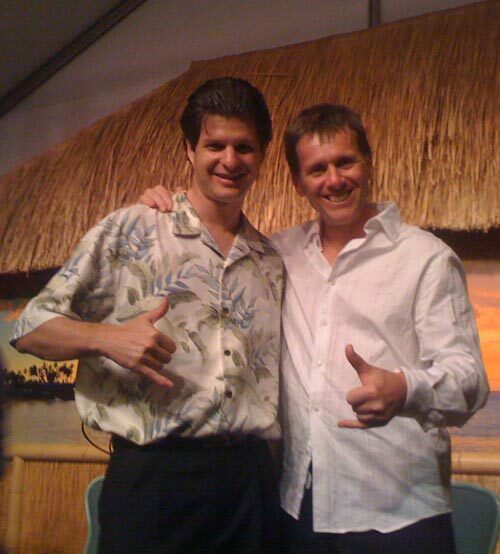 The young man was Peter deAquino, who together with his first cousin Garrett Probst of the Ukelele Boyz co-host the weekly shows of George Kahumoku, Jr at Napili. After George told his stories and played his songs, he invited Robert on stage to play a solo. George then invited Peter deAquino to play Tico Tico on the ukelele and Robert to jam on his concert guitar in accompaniment. Thereafter the special guest of the evening, Jeff Peterson, son of a Hawaiian cowboy on Maui, entertained the guests with his stories of Hawaii and various styles of guitar playing. What went through my mind was this: how nice it is to know your roots so well — to be able to share stories of your grandparents and your roots and use words from your own language to describe your culture and values. Was this the slack key guitar tradition? There was more to come. The real fun of the evening came after the intermission when the Ukelele Boyz, Sterling Seaton, Jeff Peterson, and George Kahumoku all played together. What a great idea to host a weekly show and invite different guitarists to play! It was sheer joy to watch them banter on stage and jam to various styles: Hawaiian, folk, rock and roll, etc. No words can describe that wonderful evening in Napili. In those 2.5 hours, the performers communicated the essence of a Hawaiian aloha through their stories, conversations, and music. I concluded that this Wednesday show is a MUST for all visitors to Maui. I was glad that Uncle George insisted we come to this show. Mahalo! All well and good, I love hawaii guitar. Previous Previous post: Two year anniversary of Concert Blog today!